Looking Back On NPR's 2016 Election Coverage : NPR Public Editor An analysis of NPR's journalism over the long presidential campaign. 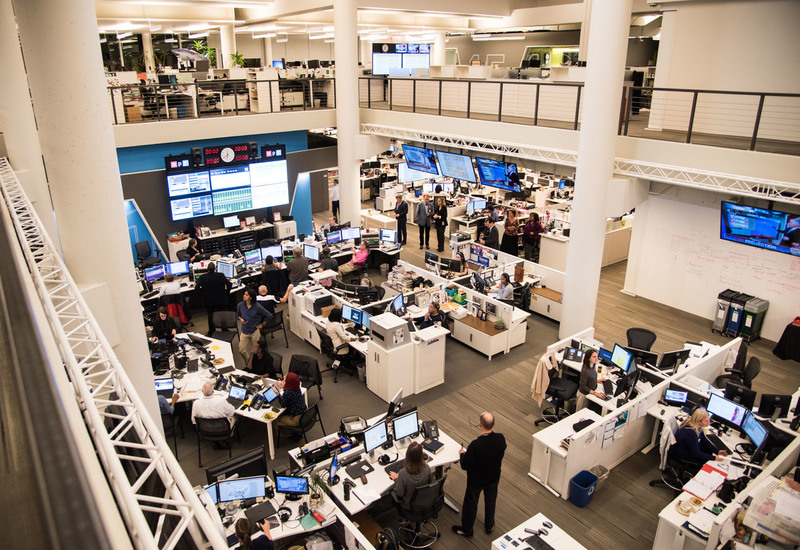 The NPR newsroom during election coverage on November 8, 2016, in Washington, D.C.
People in NPR's newsroom and elsewhere within the public radio system have been thinking hard about NPR's coverage, too. We will post some audience mail in our next column (more on that later), but for now here are some preliminary thoughts from me, taking into account input from others in the newsroom. I suspect these issues will eventually consume more than a couple columns of reflection. As others have already written, many in the media and the pundit class were blindsided by the outcome of the election, failing to understand the forces that led to the victory of President-elect Donald J. Trump over Hillary Clinton. There were multiple reasons for that, including polling that was simply off. But much of the post-election criticism of "the media" has focused on the missing voices, the supporters of Trump who were not heard. This is one issue (there are others) that seems to be at the heart of many listener and reader criticisms of NPR's election coverage. Trump supporters argue that they and their concerns were not heard. Those opposed to Trump argue that his supporters were heard too often, and not challenged enough. My office listened to all of NPR's campaign coverage. In my opinion, it did not take particular effort to hear the voices of many of those in demographic groups that supported the Republican candidate, in all their complexity. They were heard in "Divided States," for one, a prominently positioned Morning Edition series of interviews with supporters of both of the major candidates. Those interviews, while equally balanced between the two major candidates, upset many, many listeners. I had concerns about the voter interviews, too, because on some occasions the speakers were not called out on their incorrect facts, as I wrote previously. But I didn't object to hearing from the voters themselves; voters often make their decisions based on complicated reasoning, or for reasons that others will find objectionable. As Edith Chapin, NPR's executive editor, told me, "We put them on because they are real people and they have real views." That said, it is clear that some in NPR's audience believe that respectful listening to folks, which is how the NPR newsroom refers to these interviews, is unacceptable. More specifically, they are concerned that when NPR airs interviews with people who hold what they believe are racist or misogynistic or xenophobic views, it is "normalizing" those opinions. This isn't an issue that will go away, nor will everyone find common ground. Perhaps NPR could frame the interviews differently, with an acknowledgment that they are just individual voices in the wide spectrum of voices. But I believe it's possible to listen to someone with whom you disagree and not hear the interview or news report as an endorsement of his or her views. NPR's stated purpose in its campaign journalism is to give listeners and readers the information that they need to make civic decisions and to understand the broad forces at work in society — not simply to confirm what they've already decided. In my opinion, NPR did a good job reflecting many of the concerns from Trump country, in the vox pop interviews and in reported pieces, including interviews with Trump voters in Pennsylvania, Colorado and Ohio (among many others). There were also interviews with prominent supporters such as Ralph Reed, who seemed to speak for many in explaining why they would not be deterred from voting for Trump despite reports about his past bragging about behavior that would equate to sexual assault (which he later denied he had actually done). As the general election campaign geared up, my office started tracking all of NPR's election coverage. With input from the newsroom, we agreed on some criteria for the reporting. One of those was avoiding over-reliance on reporting on polls. Polling is a murky art these days (see the pre-Election Day prognostications), and my office's analysis of NPR's coverage of the Democratic and Republican primary campaigns showed poll results creeping into the reporting and newscasts regularly. Happily, that was not the case during the general election campaign. Another "best practice" was in-depth exploration of the candidates' platforms and proposed policies. Here, we found the newsroom's performance was mixed. Our tracking showed that such reports were indeed sparse in the late summer, but picked up markedly by September and October. We found no major issue that did not get examined. A detailed chart published Oct. 18 summed up the stands of four candidates (Trump and Clinton, plus Libertarian Gary Johnson and the Green Party's Jill Stein) on many issues. But in contrast to the voter interviews, the policy stories sometimes got lost. Yes, they were all there — we linked to pretty much most of them in our biweekly tracking reports — but they were easy to miss. By contrast, NPR put much more emphasis on the story of the day, the scandals, the lines of attack and the just silly (such as the multiple reports on Trump's release of medical information on The Dr. Oz Show), as well as news analysis and Monday morning and Friday evening commentary. I've already expressed my concerns (shared by listeners) about how NPR did commentary this election cycle. But here's another thought. What if NPR's newsmagazines had given similar prominent treatment each week to looking at the candidates' platforms and proposed policies, in a dedicated slot that listeners would know when to tune into? Just one example: I've gotten quite a bit of feedback to this very good in-depth online piece fact-checking Trump's first 100 days action plan, along with laments along the lines of "why didn't NPR report this earlier?" It did, in several pieces. Two of them were more of the campaign trail variety of story. One covered more policy, with a clear web presentation, but, because it dealt with both Trump's and Clinton's plans, had nowhere near the detail of the later piece. Each of his points (and Clinton's, since at that point we didn't know who would win) could have supported a separate story. As one public radio journalist pointed out to me, this story about the candidates' plans epitomized the challenge, not just for NPR but for all media: "There's a problem Trump continues to create for himself: These policy proposals are often lost in the headlines created when Trump dwells on grievances against his perceived enemies in the media, government and other "elite" power structures. Take Trump's recent speech in Gettysburg, Pa., which was billed as the rollout of his agenda for the first 100 days of a Trump administration. Trump began the speech by promising to bring legal action against women who have accused him of sexual assault and harassment. This new threat — and not the repackaged proposals he had spoken about before — became the day's news." But it's only the day's news for NPR if NPR lets it be. Which brings me to one other point. One sure way for a newsroom to break free from the "story of the day" is to set the agenda itself, through enterprise reporting. The Washington Post did that brilliantly this election cycle, with David Fahrenthold's dogged investigation into Trump's charitable contributions. NPR did interview Fahrenthold on the air, and reported on other organizations' reporting, including the Trump tax documents that were leaked to The New York Times. But it did relatively little of its own enterprise reporting (one exception was David Folkenflik's examination of Clinton's media strategy). I've asked a number of people within NPR for an explanation and got conflicting answers. Among them: NPR has a lean staff and extra money was not put into the politics budget when it was being assembled. Michael Oreskes, NPR's head of news, said a decision was made to focus energies and resources elsewhere (see his comments below). Whether there was an appetite at NPR for such original campaign reporting is unclear to me. Whatever the reason, I wish NPR had done more of it. So what did NPR get right this time around? So much! I think it's important to acknowledge just what a massive undertaking NPR's coverage was, and how much of a radical change that meant for the newsroom. Overall, from the point the primaries ended through last Monday (June 12 through Nov. 7, and excluding the two convention weeks), NPR turned out 1,351 campaign-related stories for the weekday and weekend Morning Edition and All Things Considered newsmagazines and online. Those numbers do not even include the newscasts, conversations on the midday Here & Now, all the NPR Politics Podcasts, or social media, including Facebook Live reports and reporters' Twitter updates. (It also does not include On Point, Fresh Air, Latino USA or The Diane Rehm Show, which NPR distributes but does not produce). Reporters were out and about far more than in the past, veterans tell me, covering the story from the ground and not just the campaign planes. Christopher Turpin, vice president of news programming and operations and a 16-year NPR veteran, said it was by far NPR's biggest-ever campaign effort, particularly on the digital side. As a portion of the audience migrates away from radio to podcasts and online, two digital initiatives stand out, the resource-intensive initiatives to which Oreskes referred earlier. The NPR Politics Podcast brought together veteran reporters, such as Ron Elving, with the "next generation of politics reporters and a diverse team," Chapin said. In my opinion, they looked at the campaign through some insightful windows, such as Asma Khalid's demographic reporting. In a sea of political podcasts, NPR's stood out, and listeners responded; the podcast had 9.3 million downloads during October. On top of filing reports for the newsmagazines and special live coverage, the team was also putting out the podcasts nightly for the last two weeks leading up to the election. The other innovation was fact-checking, which, as I've said before, NPR's audience was demanding. NPR got a slow start on the fact-checking in the primaries, Turpin said, and we, too, found it a somewhat scattered approach initially. But fact-checking came into its own during the four presidential and vice presidential debates, when newsroom teams of 30 or so people fact-checked and annotated debate transcripts and did it in close to real time. It was both a strong journalistic service and an innovative technical approach, and the NPR audience responded. How much was too much Trump? A recurring complaint, from radio listeners in particular (as opposed to users of NPR.org), is that they heard from and about Trump far more often than Clinton. This is despite the fact that Trump never gave an interview to NPR. That is not unprecedented but it's rare; according to the NPR Research, Archives, and Data Strategy department, since NPR went on the air in 1971, the only two previous candidates that NPR did not interview specifically during their candidacy (and who weren't incumbent presidents) were Bob Dole in 1996 and Mitt Romney in 2012. Both had been interviewed by NPR before undertaking their campaigns, however, unlike Trump, who has never been interviewed by NPR. There's nothing like a direct interview, of course, and I'm told that NPR was persistent in its requests to interview Trump and never got a clear answer as to why an interview was denied. Barring that, NPR turned to sound bites from the campaign trail, and interviews with campaign surrogates and with supporters. Based on the tracking my office did, listeners are right: They heard and read far more coverage devoted to Trump than to Clinton (although they are incorrect that most newscasts led with Trump over Clinton; the split was closer to a toss-up, according to our limited tracking of this). The final story totals were 461 pieces with Trump as the main focus to 262 focused on Clinton. There were also nine focused on Johnson, three each on the Green Party's Stein and independent conservative candidate Evan McMullin, and eight on Bernie Sanders (who by the mid-June starting point of our counts had essentially lost the Democratic nomination to Clinton). Another six stories focused largely on the third party candidates. The largest number of stories, 599, looked at more than one candidate or addressed wider election issues. Are these numbers appropriate? Some listeners complained that NPR gave too much free publicity to Trump and he was certainly a master at generating attention for himself. But the stories about him were a mix: interviews with supporters, critics, and analysts. Given that Trump was largely unknown and unscrutinized as a political figure (unlike Clinton), it seems appropriate to me that he got more attention. Too much? I'm not sure. I do feel that there were some stories — such as the coverage of the leaked Access Hollywood tape where Trump is heard bragging about groping women without their consent, and the aftermath when other women made accusations of inappropriate behavior — that perhaps NPR lingered on too long (close to four dozen different takes). This led some of his supporters to see a bias against him. This summer, when we started tracking the campaign coverage in earnest, Michael Oreskes articulated NPR's goal for me: "Are we getting across to you the material you need about both candidates? That's the challenge. That's what we should be judged by. We may actually give you more about one than the other, but as long as we've given you enough about both then I think our job is getting done." He also said he believed NPR had brought more diverse voices from all over the country into the conversation. He argued that, while some listeners did not like these interviews, "I think it's incredibly valuable for people to hear other people with views different from theirs," adding that the interviews were "quite helpful in understanding what voters thought and why they had come to whatever conclusions they had come to." And, he said, "I'd like to figure out ways to do more of that going forward." Asked what could have been done better, Oreskes cited the critiques of the joint NPR/PBS convention coverage, which did not translate well for radio. But he defended the effort, saying it "moved public media forward" by ending duplication of efforts, and that must continue. His most important critique — and one I agree with wholeheartedly — is that NPR, as with all of media, was "slow to recognize the power of this angry outsider feeling that gripped a lot of the country this year." He added, "It took awhile for us to fully grasp what it was." Khalid's demographic reporting was incredibly valuable, he said, but, "I only wish we had started sooner." He added, "If I had it all to over again, I would have started her two years earlier," after the 2014 mid-term elections. Likewise, he said he wished NPR had begun working more collaboratively with member station reporters much earlier, as it did later in the campaign, which generated some strong on-the-ground reporting (120 reports in total, some that ran nationally and some locally or regionally only). I heard similar sentiments from others in the newsroom. Turpin, for one, said NPR was "a little slow to spot the two mass movements in this campaign," the ones behind Trump and Sanders. He added, "As an organization, if the election has taught us one thing it is to really think about how broad the political spectrum is in this country." That may be small consolation to those who wrote the Ombudsman office for months with concerns about the Sanders and third party coverage, but it is honest, and I would hope and expect that it would inform coverage going forward. Oreskes said it would. NPR has made a commitment to what is being called the Statehouse Project, through which NPR and member station reporters will work together to expand coverage of state government and political coverage state by state. In theory, this should also give NPR more insight into what is happening outside the major cities where its journalists are concentrated (like many major news organizations). For more thoughts from Oreskes, read or listen to his commentary from Saturday's Weekend All Things Considered. These are some of the issues I've been thinking about. While it's not possible to respond in detail to all the letters we have received about the campaign coverage, this column covers some of the major concerns we have heard. That leads to a final point. Only those with concerns tend to write my office; by and large we do not hear from those who appreciate the coverage that NPR provides, even though we know there are many more fans than detractors out there. (NPR's on-air and online audience has soared this election season, so it must be doing something right.) We want to hear that other side, too, with thoughts about what NPR did right and why you liked it. Write us, please! Use the Contact the Ombudsman link here, or let us know in a comment on our Facebook page. Editorial researcher Annie Johnson and intern Anna Mazarakis contributed to this report. This post has been updated to include listener feedback and to better identify the NPR Research, Archives, and Data Strategy department.